Awwww…. 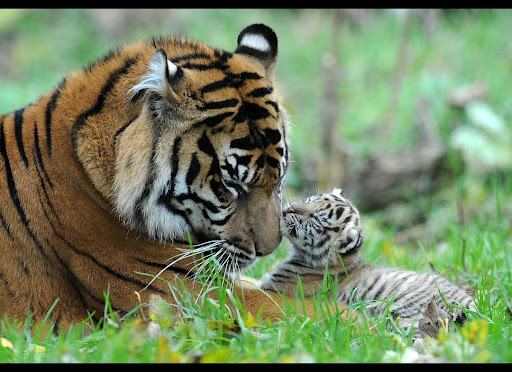 it’s Valentine’s Day, but instead of flowers and chocolates, I got you this cute picture of a tiger cub giving his mum a kiss (image from here). Unlike many of my posts where I put in gratuitous pictures of my cat, this one actually is in reference to something – namely an event I’m holding on March 18 for the single people out there who don’t get much attention on Valentine’s Day. It’s a Murder Mystery party to raise funds for tigers via TRAFFIC – for the same great cause as the trivia night last July! I’ll have more info about it soon, but in the mean time I would love it if you would sign this petition against tiger trade in China. Personally I think that shows a lot more love than a bunch of roses and box of chocolates! ← Glinda’s won the giveaway! Signed the petition, indeed more love than flowers or chocolates. Poor tigers.